CiviCRM is one of the best CRM solutions for NGOs and non-profits used by over 10,000 worldwide on a daily basis. Despite the frequent use, CiviCRM users did not have what they really needed – the ability to access the valuable information from their CiviCRM system such as contacts, calendar, events, activities, cases, etc. when doing a fieldwork. Since constituents of NGOs and nonprofits regularly leave their workplaces to work with local communities or vulnerable groups, there was a perceived need to equip them with a mobile application that would allow such access. Recognizing these needs and wishing to promote CiviCRM, Agiliway developed CiviMobile, an native mobile application that allows users access, add and update any information on the go, even when they are offline. Calendar. All events, cases and activities are presented to users in a graphical calendar as soon as they open the app, which helps them stay on top of their schedules. Users can further filter events, cases and activities for better visibility. Contacts. The application allows to access the list of all contacts or search through the database. Users can dial a contact in one click, add new contacts, view profiles and edit contact information on the go. Events. 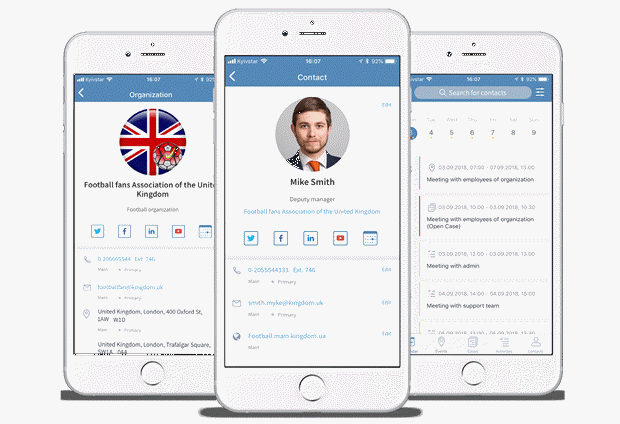 With an app, users can view all the planned events and filter them by type, date or title. Users can access events’ details and use navigation to get to its location. The app also allows to register to an event and share it asking friends to join. Activities and Cases. Users can view and edit all the relevant information on their planned activities and cases. Multiple filtering options help to find the right case or activity in just a minute. Push notifications. App users receive push notifications about all the relevant changes made in their CiviCRM system, so they never miss a thing. Offline Work. The application works in an offline mode too. Any changes made while the phone is not connected to the internet are saved and automatically executed when the connection resumes. Agiliway is actively working on the third release of CiviMobile that we expect to that will complement the app with relationship, membership, and contribution management features, as well as a Setting screen that will allow personalizing the app. The company is also continuously working on technical improvement and fixes to grant the best experience to CiviMobile users.